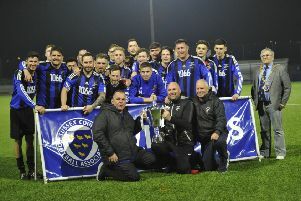 The Macron East Sussex Football League will have a second team in the last 16 of the Sussex Intermediate Challenge Cup. Sidley United joined Hollington United in reaching round four of the county knockout competition courtesy of a dramatic 2-1 victory away to Rogate 08 on Saturday. Robertsbridge scored a last gasp winner to beat Crowhurst 2-1. A 94th minute free kick from Andy Garman won it for Sidley, who will travel to Southern Combination League side Mile Oak reserves in the next round on Saturday December 9. Sidley, who are eighth in the Premier Division, had earlier opened the scoring via a Dan Hill penalty midway through the first half only for Rogate to equalise shortly before the break. Division One high-flyers Bexhill AAC made it through to round four of the Sussex Bluefin Junior Challenge Cup without kicking a ball as scheduled hosts AFC Broadwater were unable to field a team. Hastings Rangers’ second round match away to West Hoathly wasn’t played. A Crowhurst defender slides in on a Robertsbridge forward. There was action in five other cup competitions on Saturday and Division Three leaders Sedlescombe Rangers II booked their place in the Hastings & District FA Junior Cup quarter-finals with a splendid 4-1 win at home to Division One team Little Common II. A Toby Hicks hat-trick did the bulk of the damage for Sedlescombe, whose other goal was scored by Jamie Smith. Connor Jackson replied for Common. Division One leaders Northiam 75 beat Westfield II for the third time this season to reach the ESFL Premier Travel Challenge Cup quarter-finals. Goals from the prolific Scott Embery (2), Dan Laidlaw and Northiam’s man of the match Oscar Garcia Cruz gave them a 4-3 victory and a home tie against Mountfield United. Crowhurst and Robertsbridge tussle for possession in midfield. Rye Town began their defence of the Robertsbridge Charity Intermediate Cup with a narrow 1-0 extra-time time victory at home to fellow Premier Division side St Leonards Social. Richard ‘Alfie’ Weller scored the only goal shortly before the end of the additional half-hour. In the other first round contest, The JC Tackleway edged out Division One rivals Mountfield United 4-3 thanks largely to a Kale Williams hat-trick. Callum Fisher scored Tackleway’s other goal, while Jon Novis, Matt Tidmarsh and Sean Smith (penalty) netted for Mountfield. Several second round ties were played in the Robertsbridge Charity Junior Cup and there were a couple of surprises among them. Division Four high-flyers Orington achieved a terrific 4-3 win at home to Wittersham, of Division Two via the finishing of Thomas Blything (2), Scott Quested and Andy Swindles. Crowhurst and Robertsbridge compete for a bouncing ball. And Division Four leaders Bexhill AAC II triumphed 4-2 away to a Catsfield side lying fourth in Division Three. Strikes by Dominic Sinden, Scott Oliver, Ian Rise and Vinny Heron gave AAC the victory. In another game to end 4-2, Division Two outfit St Leonards Social II won away to Bexhill Broncos, who are second in Division Four. Two Division Two versus Division Five affairs proved rather one-sided. Mayfield won 7-0 at home to Robertsbridge United II and Hollington United II prevailed 6-0 away to Northiam 75 II. A Daniel Andrews led the way for Hollington, whose tally was completed by one apiece from Graham Stovell, Daniel Kearley and Kelvin Lowes. Sandhurst were unable to raise a side for their game at home to fellow Division Three club Punnetts Town. The quarter-finals will see Orington host Punnetts, St Leonards at home to The JC Tackleway II or Sedlescombe Rangers II, Bexhill AAC entertain West Hill United and Hollington against Mayfield. Crowhurst and Robertsbridge compete for the ball. There were also games in all of the league’s six divisions on a sunny but chilly afternoon. The clash of the Premier Division’s top two, Hollington United and Battle Baptists, was postponed, but the other three top flight games did go ahead. Doni Dovla marked his return to Bexhill Town from Hollington with a hat-trick in a 5-1 win at home to Hawkhurst United. Ashley Collins claimed Bexhill’s other two goals as they beat Hawkhurst for the second weekend running and moved into the top four to boot. Leon Fisher replied. A last gasp goal from Ben Thorpe earned Robertsbridge United a 2-1 win away to Crowhurst and with it a place in the top five. Gary Croft had given Crowhurst a half time lead before Curtis Coombes equalised for Robertsbridge. Second-bottom Ore Athletic and third-bottom Sedlescombe Rangers contested a 1-1 draw. Liam Baker was on target for Sedlescombe and Jamal Bsharah continued his goalscoring run for Ore.
Herstmonceux climbed off the foot of Division One by dint of a 4-2 success away to Wadhurst United. Two Toby Guest goals, and one each from Jack Nicholas and Oliver Brooks gave Herstmonceux their second league win of the campaign. The top three teams in Division Two all won, so leaders Icklesham Casuals remain two points clear of second-placed Sovereign Saints having played an extra match, with Bexhill United II a further five points back in third. Icklesham triumphed 4-1 away to Battle Baptists II, whose goal was scored by Frazer Discala. Sovereign Saints were even more convincing winners, seeing off Bexhill Rovers 6-1 at Shinewater Lane. Philip Broom (2), George Sambrook (2), Jack Murphy and Chris Williams were the Saints’ scorers. Bexhill prevailed 3-1 away to Peche Hill Select, despite a Shane Friend goal for Peche. In the only Division Three fixture, Pebsham Sibex won 2-0 at Hawkhurst United II to move up to third. Nick Gamble scored both the goals. There were two matches in Division Four and it was honours even at Ark William Parker Academy as fourth-placed South Coast Athletico and West Hill United played out a 2-2 draw. The goals of Lee Finnigan and Connor Easton for Athletico were cancelled out by a Daniel Wilkes double for West Hill. An Alex Southall goal couldn’t save Ninfield VFC from a 3-1 reverse at home to Cranbrook Town. Three games were played in Division Five, although none of them involved the top three sides so the situation at the head of the table is unchanged. Battle Baptists III moved up to fourth courtesy of a 3-0 win away to Beckley Rangers. An Aaron Jamieson brace and one from Richard Chambers gave Battle the points. Beckley have now dropped to the foot of the standings because AFC Hollington pulled off a 5-2 success away to West Hill United II. Strikes by Harry Kidd (2), Aaron Hatton (2) and Jordan Hatton gave Hollington their second league victory of 2017/18 despite a Mike Hawley brace for West Hill. Icklesham Casuals II and Wittersham II drew 5-5 in a 10-goal thriller. Solomon Cooke plundered a hat-trick for Icklesham, whose other goals were netted by Michael Beaumont and Ricky Baldwin. In the Eastbourne FA Vice-Presidents Cup, Magham Down won 2-0 at home to Parkfield, Victoria Baptists triumphed 3-1 at home to Herstmonceux II and Hampden Park lost 4-2 at home to Polegate Town II. A Robertsbridge player turns away from a Crowhurst opponent.